The title is quite ominous all by itself – Time Runs Out! But runs out on what? And who is it running out on? 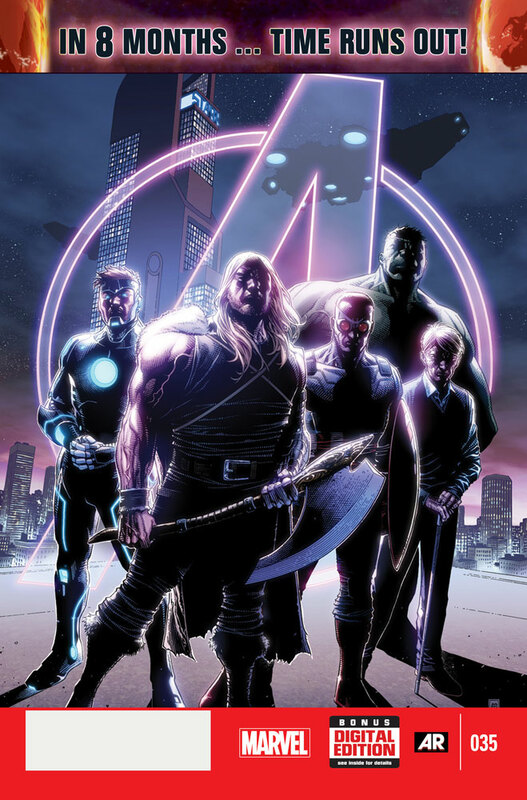 Fans of the Avengers already know at least some of the answers to those questions as for the past couple of months Jonathan Hickman’s storyline casting the Avengers and the rest of the world eight months into the future (now seven) has been unfolding. The question that haunts our favorite superhero characters is: What kind of person are you when your very existence is threatened? The Marvel Universe as we know it is part of a larger scheme of multiverses – other universes parallel and often similar to ours but varying in different ways. The Ultimate Universe (part of Marvel’s other line of superhero comics with new and inventive twists on classic characters) is one alternate universe, but there are many others and they have been collapsing in on one another for some time. The storyline in New Avengers has centered on these “incursions” into the Marvel Universe and the danger it poses to it. Hickman is doing a great job of pacing this story. Each issue unfolds with a new surprise and a new mystery. Susan Storm is working for SHIELD? The Submariner humbled by Doom? Thor (the male one) going on a suicide mission? The Molecule Man in the confines of Latveria? And when did Captain Britain not only lose an eye but join the Illuminati? Axis is supposed to be the highlight of the Marvel Universe right now, but this is by far the better story and the more intriguing one as well. It doesn’t have a cool logo that flips upside down, but it has good art, great writing, and if you didn’t follow along with this storyline, you’ll be behind the eight ball when Secret Wars comes out next year! 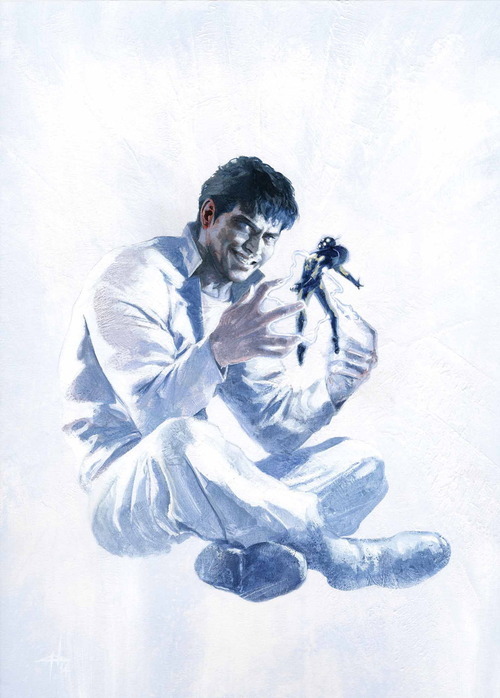 Image for New Avengers #29 cover – is that Hank Pym in the Beyonder’s hand? I am a little skeptical about how this will all work out. 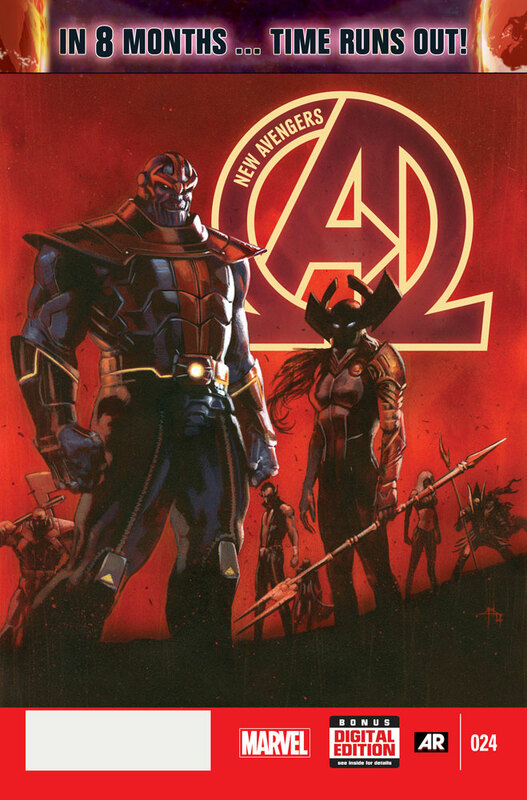 I’m not big on characters like the Molecule Man and the Beyonder (who apparently we will see in New Avengers #29 if the cover art is a giveaway). I think they cheapen the art of storytellilng. They are too easy to rely on. Just “say” the right words and all of reality is rewritten. But Hickman has been doing such a good job so far, I’m willing to give him some slack to see where this all goes. Hopefully you’ll come along for the ride! Next Next post: Marvel Cinematic Universe PHASE 3 REVEALED!